Bihar Leader of Opposition Tejashwi Yadav on Sunday blamed Chief Minister Nitish Kumar and Deputy Chief Minister Sushil Kumar Modi for the Rs 2,000-crore Srijan scam in Bhagalpur and other districts of the state. He also alleged the involvement of several Bharatiya Janata Party (BJP) leaders in the scam. 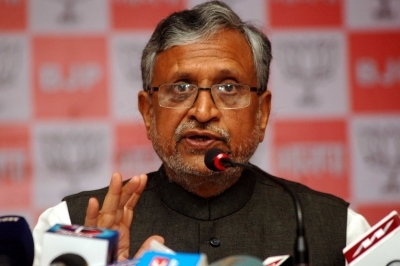 “Nitish Kumar and Sushil Modi are responsible for the Srijan scam. The state government led by them is busy eliminating evidence and trying to divert the issue to save their skin,” Tejashwi Yadav, former Deputy Chief Minister, said at a rally in Bhagalpur to launch the Rashtriya Janata Dal (RJD) campaign against the Srijan scam. “But we will not sit silent and have decided to intensify the agitation to expose their involvement in the scam before 11 crore people of Bihar,” the RJD leader said. He said Sushil Modi and his family members are involved in the Srijan scam. Tejashwi Yadav called Nitish Kumar as a “Bhishma Pitamah” of moral corruption for breaking the Grand Alliance of JD-U, RJD and Congress and forming a new government with the BJP. He said Nitish Kumar has betrayed the people’s mandate for personal interest and “he is the biggest socially corrupt leader in the country”. Tejashwi claimed that senior BJP leaders including Union Minister Griraj Singh, former Union Minister Shahnawaz Hussain, and party MP Nishikant Dubey were involved in the scam and they have looted government money. “Srijan scam in Bihar is bigger than Vyapam scam in Madhya Pradesh. Both scams took place in BJP-ruled state,” he said. After the opposition RJD demanded a Central Bureau of Investigation (CBI) probe into the “mega scam”, the Chief Minister last month recommended the same. The CBI has already began the probe into it. The Srijan scam involves a Bhagalpur-based NGO, Srijan Mahila Vikas Sahyog Samiti Ltd, which used to provide vocational training to women. The NGO allegedly pilfered funds meant for government welfare schemes from the bank accounts of the Bhagalpur district administration. According to police, so far 20 people have been arrested and over two dozen FIRs, including 10 by CBI, have been lodged in connection with the scam.